Previous Vilnius-Lithuania iGEM teams had visited many schools in Lithuania and gathered valuable experience, which convinced us that it was essential to create better and more engaging means of teaching lifesciences to high school students. Therefore, our team decided to explore the opportunities for improving the visualisation and explanation of synbio and genetic engineering. In order to examine the handiness and appliance of our framework, it was necessary to let the potential users test it and get the feedback from them. We arranged a meeting with the representatives of the Ministry of Education and Science in order to present the AR app as a new and engaging method for education and to discuss the future possibilities to use it for national teaching programs. In case you wanted to create an AR app on your own, you can find the code and instructions here. Previous Vilnius-Lithuania iGEM teams had visited many schools in Lithuania and gathered valuable experience, which convinced us that it was essential to create better and more engaging means of teaching lifesciences to high school students. Students often face many difficulties in understanding and visualising sophisticated scientific concepts and phenomena, especially in fields as complex as synthetic biology. Therefore, our team decided to explore the opportunities for improving the visualisation and explanation of synbio and genetic engineering. 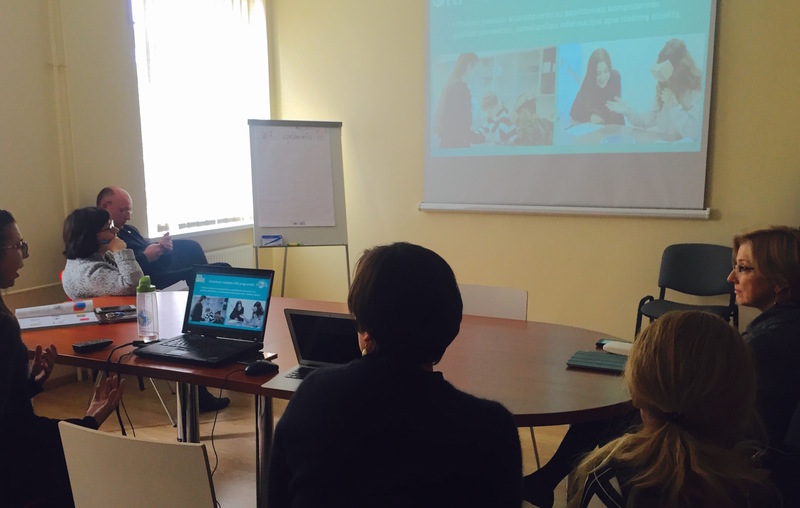 Many internal discussions and considerations led us to realising the necessity to consult with Lithuanian teachers. 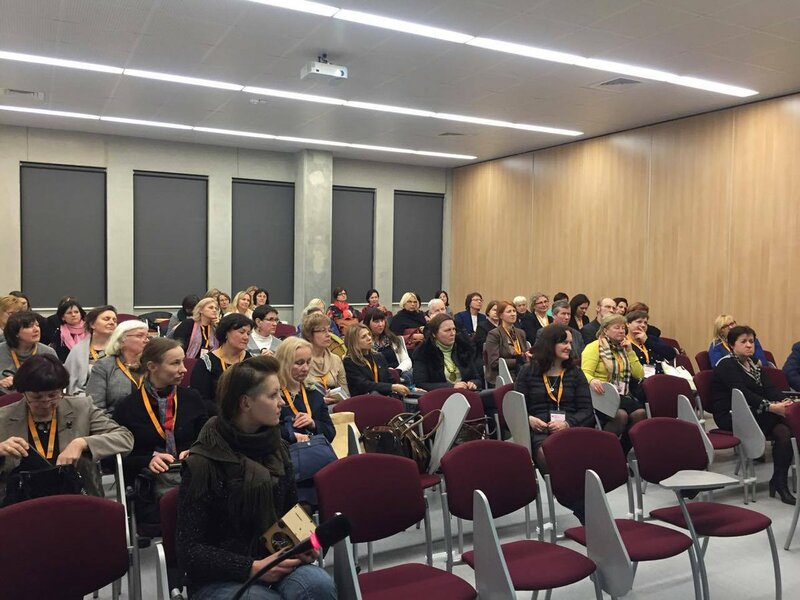 We seized the opportunity to meet them at the conference for the most outstanding Lithuanian biology teachers, where we discussed the future strategy and main aims of our educational activities. 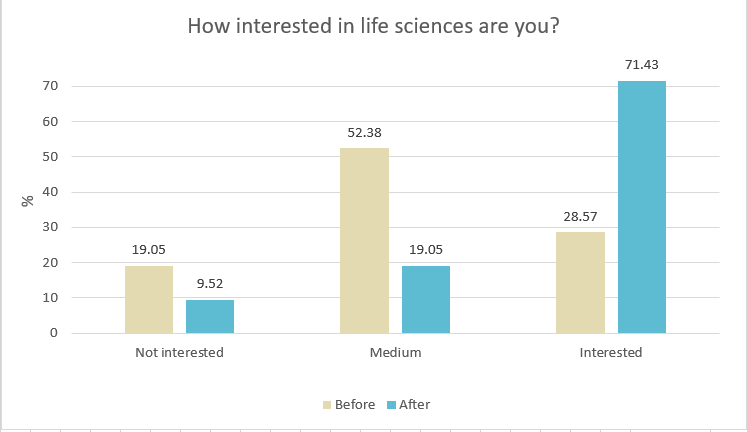 As the teachers were highly excited about our eagerness to improve the teaching of lifesciences, they provided valuable insights and acquainted us with common issues of the learning process, one of which was envisioning scientific concepts. The extensive feedback led to the idea of 3D visualisations. 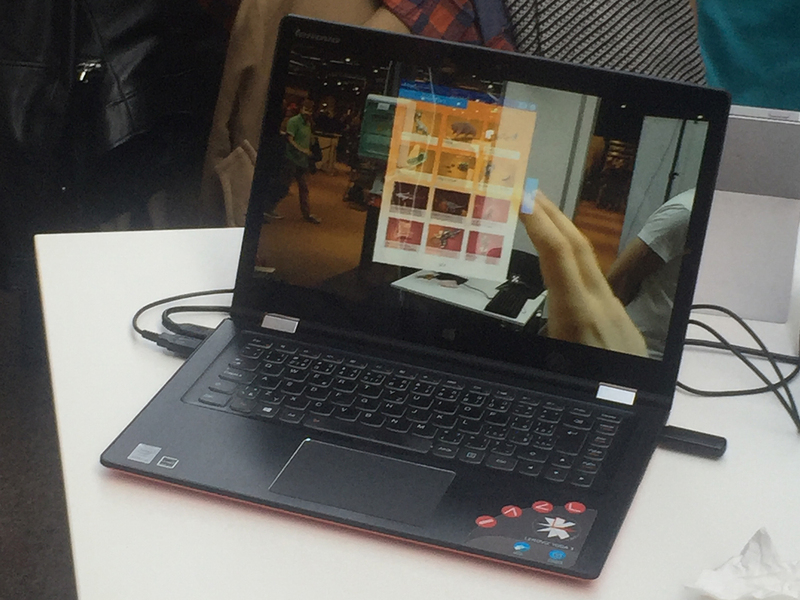 Thus we started exploring the opportunities and novel approaches of visual methods of teaching and discovered the Augmented Reality (AR) technology. As AR enhances person's current perception of reality by allowing to project various 3D animations on real surroundings, it can undoubtedly improve the process of learning without isolating the user from the real world surroundings, as virtual reality does. Even though AR technology is not completely new, it is still poorly developed. This is why our team decided not to follow the beaten path of developing short-lasting games for education, but instead chose to design a framework for continuous teaching. We made it in such manner that teachers, lecturers, and members of the iGEM community could easily build upon. By adding the desired 3D models, animations and sound, everyone would have the possibility to tailor our framework for their own educational purposes - regardless of the age group or discipline taught. In order to examine the handiness and appliance of our framework, it was necessary to let the potential users test it. While we needed to decide on the age group of our target audience, we developed various scenarios for children of different ages, starting with the youngest ones who had no understanding about science in general and ending with high school students who most probably had already chosen to pursue a career in science. As synthetic biology is a tremendously prospective, yet a very complex discipline, it is crucial to indicate the right age for the first introduction with synbio. Therefore, our focus was to develop an app that was easily understandable and appealing for scholars from 6th to 8th grade. Scholars of this age are usually already familiar with some scientific concepts and are able to grasp the main ideas and principles of synthetic biology, but do not have a firm perception of science yet. 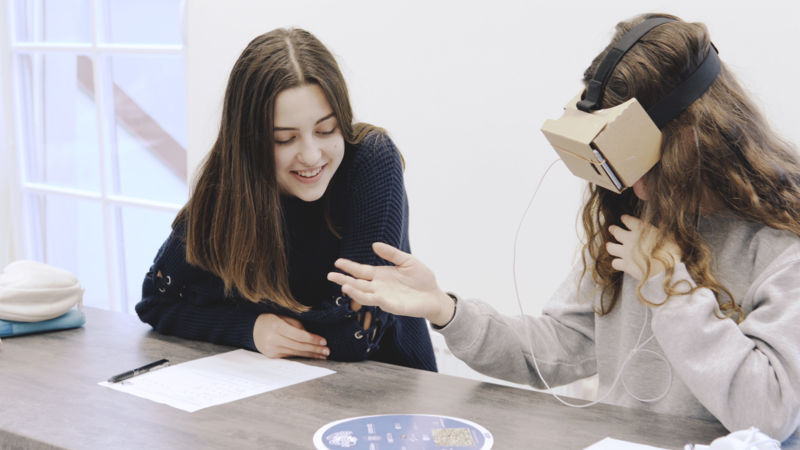 After creating a demo version of our app for synbio education, we introduced it to pupils at the Vilnius International School. 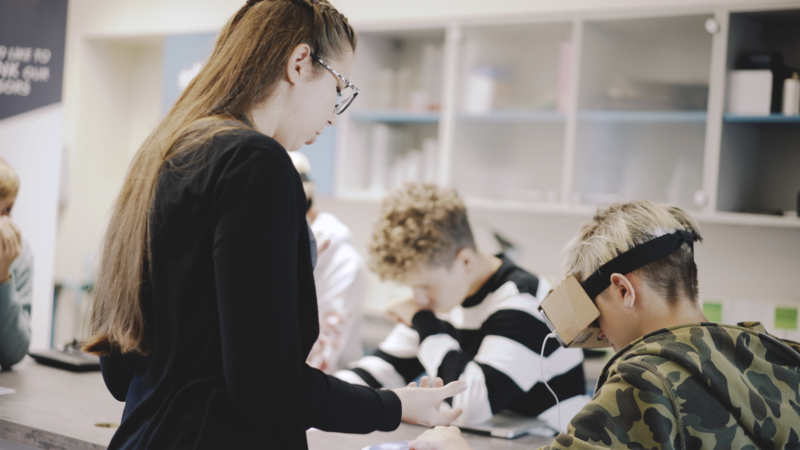 The 8th grade students had the opportunity to experience the augmented reality for learning the concepts of synthetic biology and genetic engineering first hand. The scholars showed major interest in the augmented reality app and were very excited to play and learn. As a way of collecting feedback, the children filled out questionnaires about their experience. 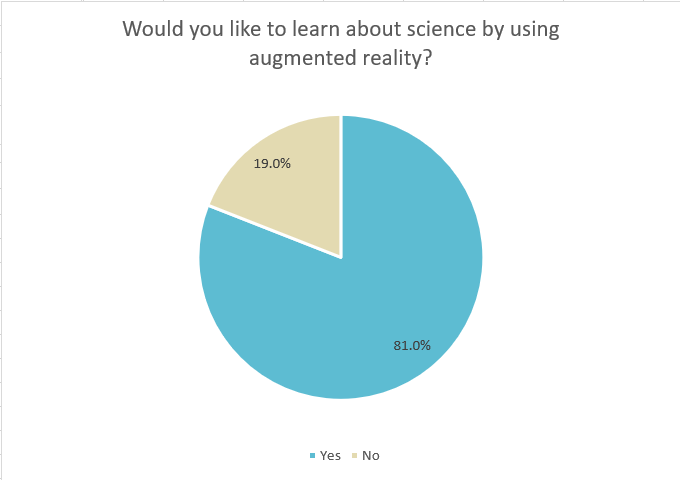 More than 80 % of the children stated that they would like to use augmented reality to learn science. While the vast majority were deeply engaged and had a positive attitude towards augmented reality based means of learning, some children provided valuable comments towards improving the interface of the framework and making it more user-friendly. Another aim was to indicate if our approach of teaching scientific disciplines would encourage children to get involved in science. 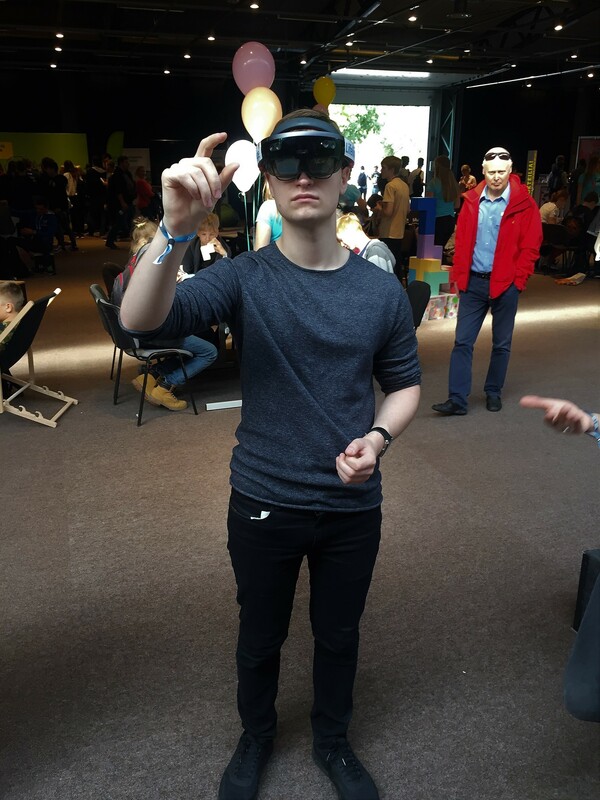 With only 30% of the children interested in lifesciences before using our AR app, almost 70% of the children were very interested afterwards. Throughout and after the trial, we received numerous questions about synthetic biology and what potential it carries, thus establishing a valuable discussion about possibilities and limitation of lifesciences. The children were very impressed and demonstrated great interest not only in lifesciences, but in our AR framework as well. To further develop and spread the message about our AR framework prototype, we met the representatives from the Ministry of education and science, and introduced them our idea. We proposed that our framework could be easily adapted as a tool for children teaching and the integration of life sciences to the current National education programme. The ministry replied with astonishment and showed great eagerness to further collaborate and develop our idea for implementing this novel model of teaching in the future educational programmes. In order to create an AR app, receive our framework with the instructions on how to use the code, by clicking here.